If you asked us what our most popular range of clothing is at Apache, Replay’s Hyperflex jeans would have to be up there. Customers adore the cutting-edge stretch technology, supreme comfort, and authentic denim look of Hyperflex denim. You just can’t beat Italian when it comes to jeans. Here’s our picks of the best new Replay Hyperflex jeans for AW17. 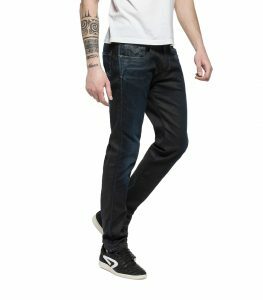 Made from a killer combo of elastane, cotton, and polyester, Hyperflex jeans will last years without losing their integrity of shape. That’s why we always remind customers that a pair of Hyperflex jeans is not just a fashion statement — it’s an investment. Don’t forget to use our exclusive offer code HYPER17 to get 10% off all Replay jeans! Let’s kick off with this washed grey jean, a brand new arrival for Autumn Winter 2017. It’s a versatile jean that can be matched with almost everything, from a light-colour polo shirt to a classic sweatshirt. Usually guys prefer darker washes for autumn/winter season, but with a relatively light 11.5oz stretch denim, you’ll be happy wearing this all year round. Replay’s high-quality manufacturing is on full display, with classy touches like hand-sandpapered whiskers and a 3D crease finish. The advantage of dark wash jeans is that they can be matched with virtually any colour you like. This particular jean is clean and smart enough for a “dressed up” look, if you’re looking to make a big impression on a night out. Pair it with one of our smart casual shirts for an unbeatable smart-casual look. 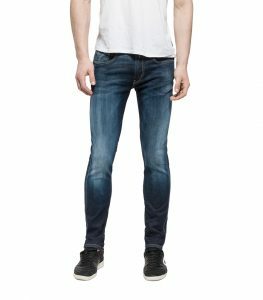 While this is a “slim” jean, it is by no means skinny or skin-hugging, making it an ideal fit for guys with “athletic” builds. 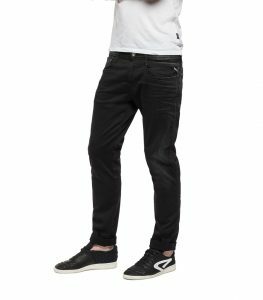 The innovative stretch fabric of Hyperflex jeans means you can feel comfortable in any position, whether chilling at home or partying with your friends. This blue-black number is one of our favourite pieces of denim at Apache. 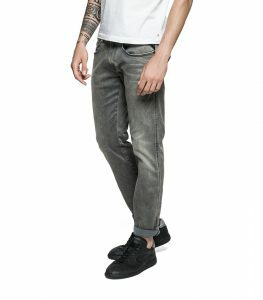 While every Hyperflex jean has a unique wash due to the manual production process, this particular jean always comes with a subtle worn look around the thighs, waistband and knees. As our model shows, they look great with a pair of trainers and a T-shirt for a timeless casual vibe. This Hyperflex jean in Washed Blue wash is a standout from our original Replay collection in 2016. We’ve done so well with this wash at Apache that we’ve been re-ordering new stock again and again. Customers love the intense blend of light and dark blue, lending the jeans an authentic vintage look. The slightly tapered leg ensures a flattering fit for all manner of guys, whether you’re in great shape or not. As with all Hyperflex jeans, we guarantee complete freedom of movement and supreme comfort, not matter what you’re up to. Like what you see? Get down to our online store and use the offer code HYPER17 to claim 10% off all Replay jeans!